President Donald Trump's daughter Ivanka Trump is to have an office in the White House, her lawyer says. The 35-year-old will have security clearance and access to classified information, but no official title or salary when she works in the West Wing. She will serve as her father's "eyes and ears" while providing broad-ranging advice, her attorney told Politico. Ms Trump, who owns a fashion brand, will join husband Jared Kushner, who is a senior adviser to the president. America's other next first lady, Ivanka Trump? Are the Trumps the next political dynasty? The US first daughter said in a statement: "While there is no modern precedent for an adult child of the president, I will voluntarily follow all of the ethics rules placed on government employees. "I will continue to offer my father my candid advice and counsel, as I have for my entire life." After Mr Kushner's White House appointment was announced, Ms Trump said she would focus on settling her family in Washington rather than work for the administration. Her step-mother, First Lady Melania Trump, has so far chosen to stay in New York with Mr Trump's youngest son. Ms Trump's lawyer, Jamie Gorelick, told AP news agency: "Our view is that the conservative approach is for Ivanka to voluntarily comply with the rules that would apply if she were a government employee, even though she is not." But some have criticised the decision to give her a White House position, even though she will have no actual job title. Andrew Herman, an attorney who has advised lawmakers on ethics issues, said: "I think the right way to do that is to make her a special government employee. "But that implicates all kind of formal and disclosure issues." The political influence of the US first daughter and her husband has raised questions about possible conflicts of interests. Federal anti-nepotism laws bar relatives of the president from being appointed to government positions. But an exception was made for Mr Kushner after the Justice Department's Office of Legal Counsel cited the president's "special hiring authority". Since the election Ms Trump has placed her fashion company's interests in a trust, handing off day-to-day operations to her top executive. Her brother-in-law and sister-in-law, Josh Kushner and Nicole Meyer, have been named trustees, reports the New York Times. However, several retailers have dropped her products, saying that sales of her brand were falling. Ms Trump is also being sued by a fashion company in San Francisco that says she is cashing in on her position as first daughter. Modern Appealing Clothing said in court documents filed last week that Ms Trump's firm has an "unfair advantage" in the marketplace. She has already forbidden her eponymous brand from advertising using images of her taken since the inauguration. 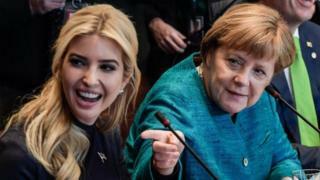 Since Mr Trump's inauguration in January, Ms Trump has been seen attending meetings with world leaders, including German Chancellor Angela Merkel, last week, and Canadian Prime Minister Justin Trudeau. Ms Trump is due to release a book - Women Who Work - in May, with the proceeds going to charity, Ms Gorelick said.